More and more U.S. companies around the world are proving that meeting the "double bottom line" - doing well by doing good - is smart business. When American firms invest abroad, they tend to invest for the long-term. They support communities where they operate. They hire local employees and are committed to treating them fairly. As a result, companies that have consistently upheld these standards have reaped the financial benefits of a sterling reputation. This is what the American brand is about: You don't have to choose between profit and doing what's right. During my time as Assistant Secretary of State for Economic and Business Affairs, I have had the honor to head a Bureau that supports this message - and the U.S. firms that embody its principles. Part of that support centers around the Secretary of State's Award for Corporate Excellence. These "ACE" awards recognize U.S. companies that go above and beyond standard business practices to add value and uphold high standards around the world. Just last week in Riyadh, I had the privilege to tour a General Electric (GE) Saudi Arabia facility that is of one of this year's ACE winners. Announced in September 2013 as a partnership between GE, Saudi Aramco and Tata Consultancy Services, it is the country's first all-female business processing center. It currently employs 1,000 Saudi and non-Saudi women and is set to grow to 3,000 in the years ahead. Assistant Secretary Rivkin visits a General Electric (GE) center that is one of the winners of the 2016 Secretary of State's Award for Corporate Excellence, on December 14, 2016 in Riyadh. GE's creation of this facility, Saudi Arabia's first all-women business services center - which now has over 1,000 employees - exemplifies GE's inclusive hiring practices within the country. The service center is not just focused on the company's operations in Saudi Arabia, but is a major hub supporting GE's worldwide operations. I spoke to several women who proudly told me about their commitment to their work, and their rapid career progression from being a service team member to a senior project manager. In a country where women account for more than half of university graduates but struggle to find good work, GE is an example of an American company recognizing and empowering talented Saudi female employees. This past February I traveled to Arequipa, in Peru, where I toured the operations of another ACE winner, Sociedad Minera Cerro Verde, a mining company that is a subsidiary of Freeport McMoRan. In a resource-rich environment like Peru, Cerro Verde understood the business opportunities that existed. But the company also recognized that they needed to be a force for good in their community. Cerro Verde wanted to ensure that its operations benefited its neighbors. They also wanted to avoid any negative impacts of their operations. In 2015, Cerro Verde completed a $5.6 billion expansion on schedule and within budget because of its proactive consultations with and investment in local communities, which included a $1 billion investment in water infrastructure that will provide clean drinking water for 700,000 people and 100 percent wastewater treatment. 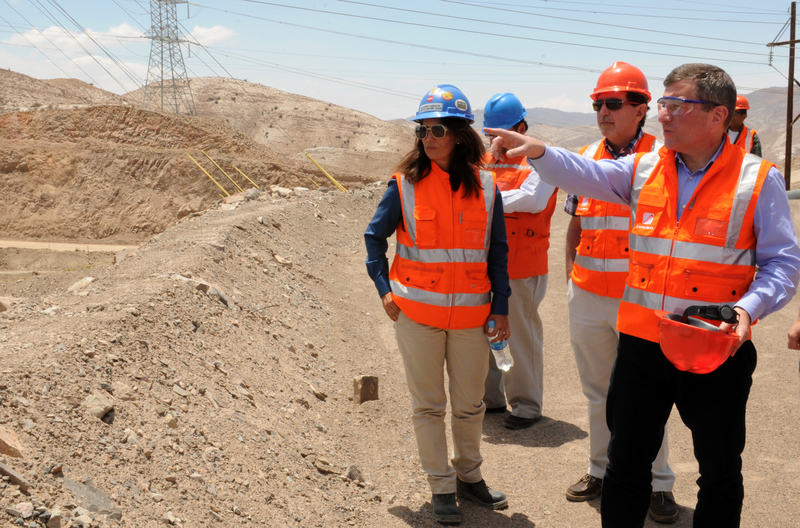 On February 9, Assistant Secretary Rivkin tours the Cerro Verde mine in Arequipa, the largest U.S. investment in Peru. He met with executives to talk about the company's recent expansion of mining operations and visited Cerro Verde's water treatment plant, which provides potable water to hundreds of thousands of people living in Arequipa. These ACE winners are just two examples of many U.S. firms that know that their responsibilities to their shareholders, their workers and their neighborhoods aren't at odds. ACE winners implement policies that mitigate risk and maximize positive contributions, and they do so in a way that makes business sense while demonstrating American values. ACE winners also show that governments all over the world want U.S. investment because of the high standards that come with it. That is why I am so proud to be part of an economic team at the U.S. Department of State that has made our corporate principles a central foundation of our economic foreign policy. •	Watch the ACE Awards livestream at 10:30 a.m. on January 5 EST at http://video.state.gov/live/.